Rickey Releford has transformed The Stammering Churchills Club from nearly extinguished to Distinguished. The Club is on track to become President’s Distinguished in 2019 and is one new member short of earning a Smedley Award. 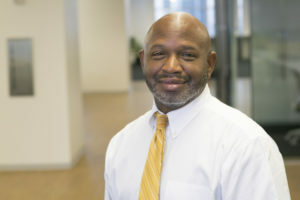 Rickey has been married to his wife Kathy for 29 years with two adult children (Kiah and Ryland), he has been employed by Jacobs Engineering for 18 years, currently as a Traffic Engineer and has been a member of the Stammering Churchills Toastmaster Club since March 2013. He was already speaking before becoming a toastmaster, therefore, his reason for joining Toastmasters was to enhance his speaking and leadership skills. After a couple of months, he gave his Ice Breaker Speech. Like most, his first leadership role in Toastmasters was serving 1 year as the Sergeant-At-Arms, 2 years as V.P. Membership and currently as a second term President. At one point during his membership, the club was close to being suspended for not having enough members. Along with the V.P. Education, they hung in there to get the club where it is today. During his first year as President, the Stammering Churchills was recognized as a Distinguished Club. As of now he has achieved his ACB and ALB awards. He also has received The Triple Crown award during the 2016-2017 Toastmasters year, which is awarded to an individual who has earned at least three educational awards in one year. The Stammering Churchills are now 21 members strong and working on more. Great Job Rickey!!! I am so proud of you! Congratulations Rickey on your accomplishments. It has been my pleasure to have met you and my honor to work with you and The Stammering Churchills Toastmasters Club. Let’s make it another great year! Rickey – amazing accomplishment. I love your attitude and enthusiasm! Congratulations Rickey, great examples to follow! Congratulations! Building a membership is no easy feat. Your determination obviously has made the difference. Congratulations Ricky on leading your club to Distinguished status last year, now on to President’s Distinguished by June 2019!